An inspirational book about life, love and loss. “It’s Not Goodbye, It’s See You Later” is an 8½ x 11’’ full-color book that includes; beautifully illustrated artwork, inspiring quotes and a collection of Richard Lawrence Belford’s inspirational parables, accompanied by his stories behind their creation. A parable by definition is a symbolic short story that illustrates or teaches some truth, religious principle or moral lesson. Richard trusts that this book will not only help bring some small measure of solace to those grieving the loss of someone dear to their heart, but also stir some emotions in you that we’ve all felt; emotions that cast a much more encouraging and celebratory light not on a person’s death, but on their life. Now, although “It’s Not Goodbye, It’s See You Later” is about loss, it’s also about the many lives, and love shared by families & friends. As just one of literally millions of people who have lived, loved and experienced loss Richard has dedicated the book to the memory, and written its forward as a tribute to his father. He hopes it makes him proud. 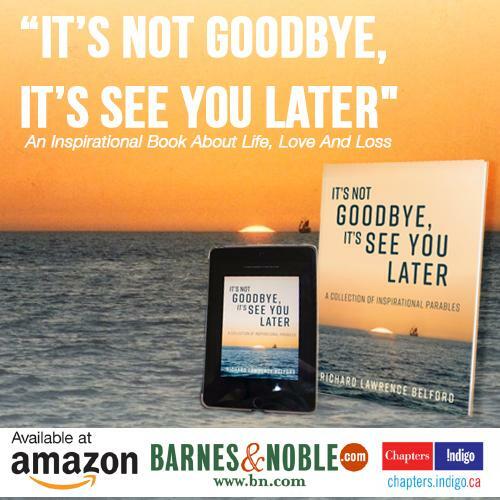 “It’s Not Goodbye, It’s See You Later” is published by innovative publisher GenZ Publishing and is available world-wide in a Paperback or Kindle edition on amazon.com, barnesandnoble.com in the United States and on chapters.indigo.ca in Canada. BARNES & NOBLE BUY IT NOW! CHAPTERS INDIGO BUY IT NOW! “The Best is Yet to Come" is exclusively available on this website. With over one million subscribers in a hundred and twenty-five countries. whose reply from Saint James Palace thanked him for his thoughtful letter and beautiful poem. In the spring of 2013 his artwork entitled; “In The Blink Of An Eye” was published on the 9/11 Memorial Artist’s Registry.